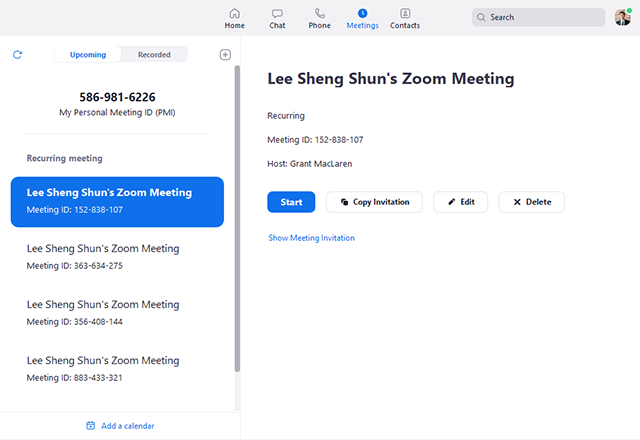 Zoom unifies cloud video conferencing, simple online meetings, and group messaging into one easy-to-use platform. Our solution offers the best video, audio, and wireless screen-sharing experience across multiple platforms. Follow this article to learn about the basic features of the Zoom client on Windows and Mac. 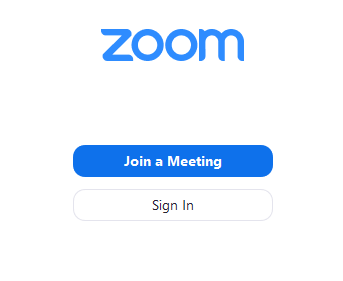 After launching Zoom, click Join a Meeting to join a meeting without signing in. If you want to log in and start or schedule your own meeting, click Sign In. To sign in, use your Zoom, Google, or Facebook account. You can also log in using SSO. 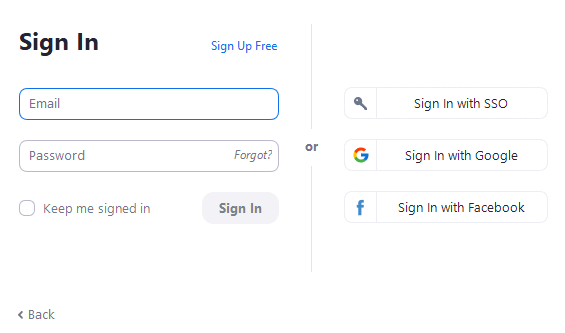 If you don't have an account, click Sign Up Free. if you have a Zoom account but cannot remember your password, click Forgot. 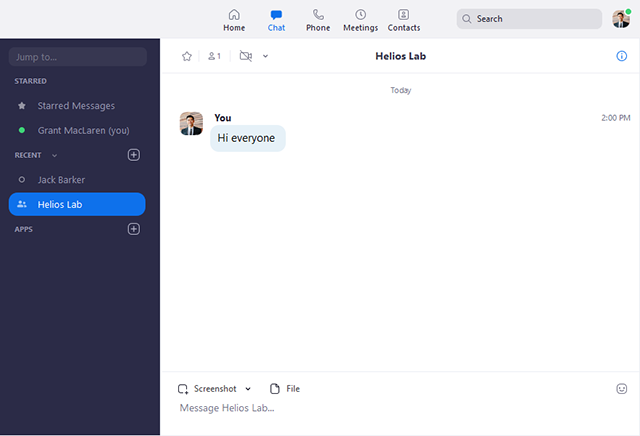 New Meeting: Start an instant meeting. Click the downwards award if you want enable video or use your personal meeting ID (PMI) for instant meetings. Join: Join a meeting that is in progress. Schedule: Set up a a future meeting. Share Screen: Share your screen in a Zoom Room by entering in the sharing key or meeting ID. Date and time with background image: To change the background image, hover over the picture and click the camera icon. Upcoming meeting: Displays the next meeting for the current day. Add a third-party calendar service if you want to sync upcoming meetings. Settings: Access settings you can change in the client. 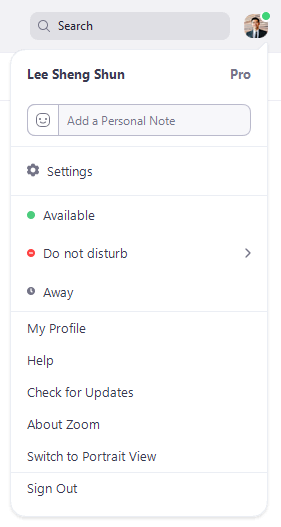 Change your status to Available, Away, or Do Not Disturb. My Profile: Open the Zoom web portal to edit your profile. Help: Open the Zoom Help Center. Check for Updates: Check if Zoom is up to date. About Zoom: View the current version. Switch to Portrait View: Switch the Zoom window to portrait view if you prefer a narrower window. Select the Chat tab to view private conversations with your contacts or group conversations (channels). Starred Messages: View messages you have starred. Click your name to use your personal chat space. Add icon (next to Recent): Start a new chat with one of your contacts, create a channel for group chats, or join an existing channel. Under Recent, click a contact to view chat history and continue to chat with them. Contacts have a status icon before their name. Under Recent, click a channel (indicated by the group icon before the name) to view the channel's chat history and send messages to channel members. Star icon : Add the contact or channel to your starred list, giving you quick access to those contacts or channels. Video icon : Start a meeting with the contact. If a channel is selected, this will start a meeting with all members of the channel. 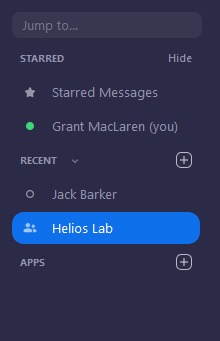 New window icon (hover your pointer over the contact or channel name to display this icon) : Opens the selected chat in a new window. Info icon : View additional options for the contact or channel. 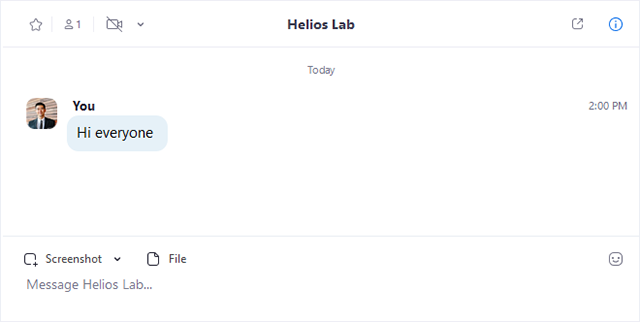 Also gives you quick access to files, images, and starred messages in the selected chat. Message box: Compose and send messages to your contact or channel. You can also send screenshots, files, code snippets, and animated GIFs. Select the Phone tab to make phone calls, view call history, and play voicemail messages. Note: Zoom Phone licence is required. History tab: View and delete call history. Voicemail tab: Play and manage voicemail messages. 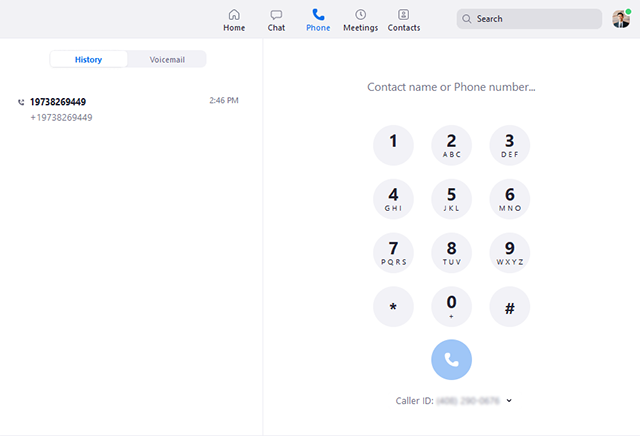 Dial pad: Make outbound calls by manually entering a phone number or searching through your contacts. 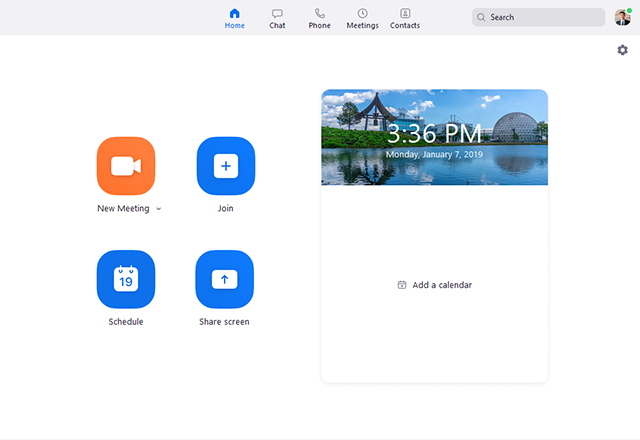 Select the Meetings tab and click Upcoming to view, start, edit, and delete scheduled meetings. Add icon : Schedule a new meeting. 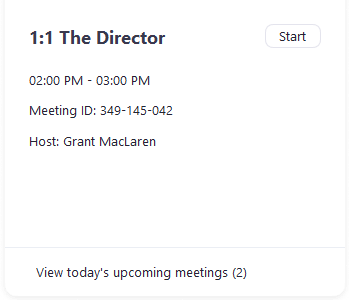 Refresh icon : Refresh the meeting list if you don't see your scheduled meeting. Start: Start the scheduled meeting that you have selected in your upcoming meetings. Copy Invitation: Copy the scheduled meeting's invitation text, allowing you to manually paste into an email, instant messenger etc. Click Show Meeting Invitation if you want to view the invitation you're copying. Edit: Edit the meeting options for your scheduled meeting. Delete: Permanently delete your scheduled meeting. 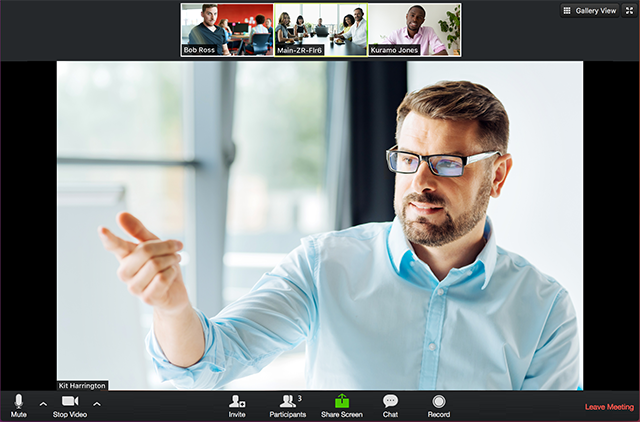 Once you have started or joined a meeting, you can access the meeting controls located at the bottom of the meeting window (move your mouse in the Zoom window to display meeting controls). Learn more about meeting controls for hosts, co-hosts, and attendees. You can also join a test meeting to familiarize yourself with meeting controls before joining a scheduled meeting.